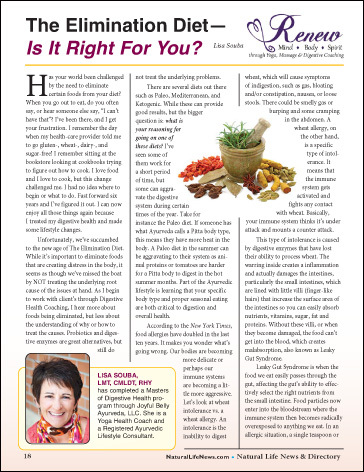 Has your world been challenged by the need to eliminate certain foods from your diet? When you go out to eat, do you often say, or hear someone else say, “I can’t have that”? I’ve been there, and I get your frustration. I remember the day when my health-care provider told me to go gluten-, wheat-, dairy-, and sugar-free! I remember sitting at the bookstore looking at cookbooks trying to figure out how to cook. I love food and I love to cook, but this change challenged me. I had no idea where to begin or what to do. Fast forward six years and I’ve figured it out. I can now enjoy all those things again because I treated my digestive health and made some lifestyle changes. Unfortunately, we’ve succumbed to the new age of The Elimination Diet.